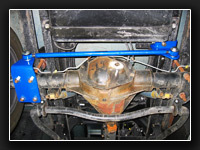 We Service, Repair and Install Lift Jack Systems. We Service and Repair Slide Outs, Hot Water Systems, Refrigerators, Camera Systems and many other coach Systems and Components. This coach is being lifted by the wheels for brake, suspension work and tires. We can lift and support any size rig for safe repairs. 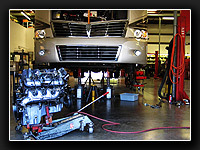 We Service, Repair and Install New and Rebuilt Engines, Transmissions, Radiators, and most other components. 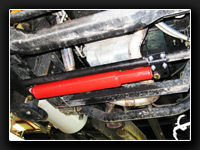 Most of our rebuilt products feature a nationwide warranty for your protection. 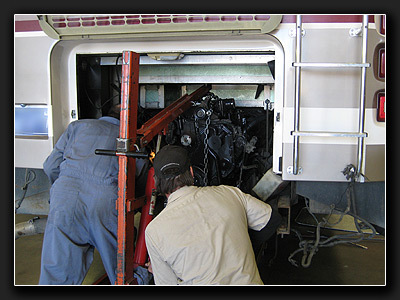 Here a rebuilt Cummins Diesel Engine is being installed in a Pusher Motor Home. 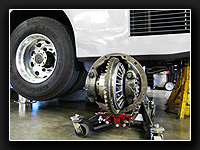 Air Conditioning (Roof, Basement and Dash), Wheel Alignment (Cars, Trucks, Motor Homes), Air System service and Repair, Brakes (Air, and Hydraulic), Custom Welding and Fabrication, New and Rebuilt Engines and Transmissions, Complete Servicing, Exhaust Systems, Mufflers and Performance Products, Generator Service and Repair (Gas and Diesel), Lift Jack Service and Repair, Shock Absorbers, Solar Systems, Tune Up and Oil Change Service, Tires, Tire Balance and Rotation, Tow Car Tow Bar and Braking Systems, Performance Products and More. 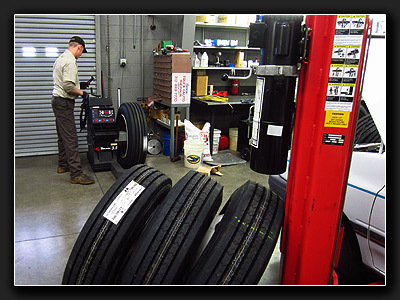 In this photo a technician is hand balancing new tires being installed on alloy wheels. 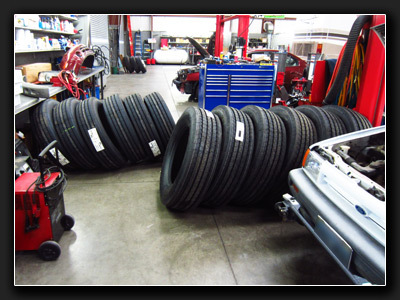 We do Alignment, Tire Balance, Suspension repairs and upgrades. 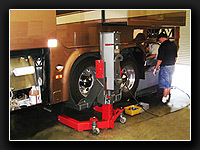 Motor Home Tires are hand mounted and balanced and then carefully installed on your coach. 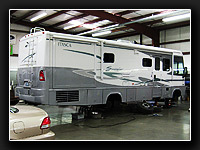 We specialize in tires and alignment for Motor Homes and use extra care when handling your alloy wheels. We have Michelin, Goodyear, Toyo and Dunlop and other name brand tires available for Motor Homes as well as most Cars, Pick Up and Medium Duty Trucks and Trailers. For Your Convenience We work with and accept most Extended Warranty Policies and Manufacturers and work with most insurance companies. We'll do the repair work, the legwork and the paperwork to get back on the road fast. 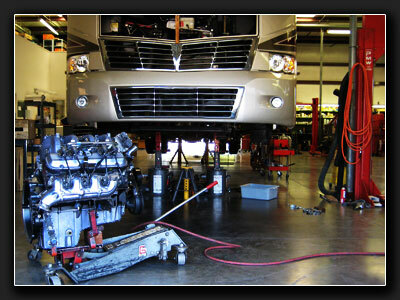 This photo shows a Workhorse Custom Chassis motor home getting a new engine. No Rig too Big! 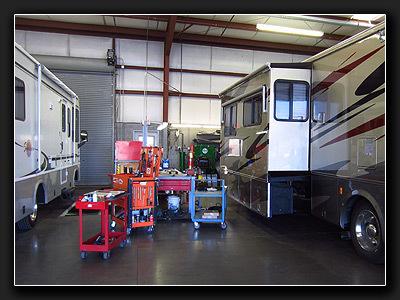 Our entire facility was designed and built to service and repair large vehicles such as Motor Homes, Buses and Delivery Vehicles. 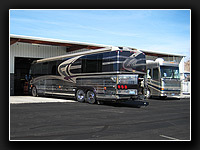 We have over 14000 square feet of shop space and 2 acres to park and store your rig. 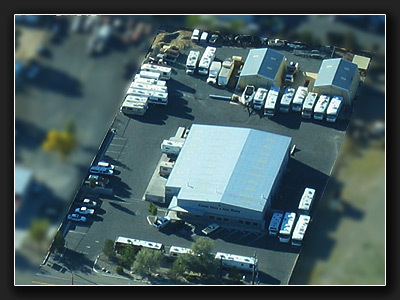 Our yard is fully fenced and monitored with 24 hour video surveillance. We work with Insurance Companies, Extended Warranty Companies, Manufacturers, Dealerships, Government Agencies, Fleet Accounts and Road-Service Providers. Thank you for checking out our facility. 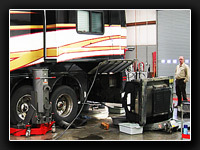 We Service & Repair all Slide-Outs and Leveling Systems. Most late model coaches have one or more slide outs. Some slides have electric motors and some are hydraulic. We service and repair them all. 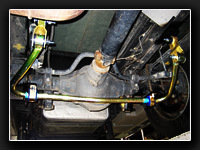 We also install, service and repair leveling systems on coaches and travel trailers. Regular maintenance and inspection will keep your slide out in tip-top shape. 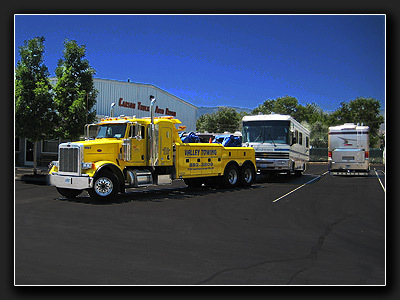 We contract with local towing companies to come to your rescue any time and for any size rig. Towing is available for Autos, Trucks, Trailers and Motor Homes any size. TIP: If you are blocking traffic and need a tow, be sure to inform the call center (Good Sam, etc.) of your situation, blocking traffic will move you to the top of the list for quick service. Low Boy service is available. 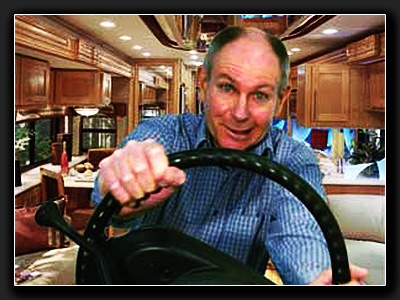 Towing can be reimbursed by Motor Home clubs like Good Sam, Extended Warranty providers and Insurance Companies. Full Service Detailing available for Inside and Out. 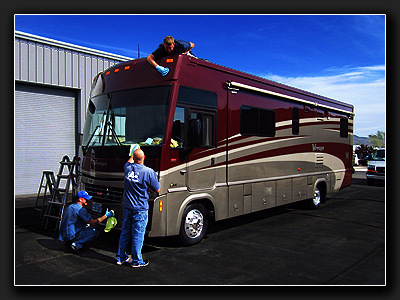 Traveling in a clean coach is so much more enjoyable, we have Full Service Motor Home Detailing available for the interior and exterior of your coach. All work is done by hand for a great finish. Here our crew is putting final touches on a fresh detail job. Winterization. Winterizing and de-Winterizing services available. 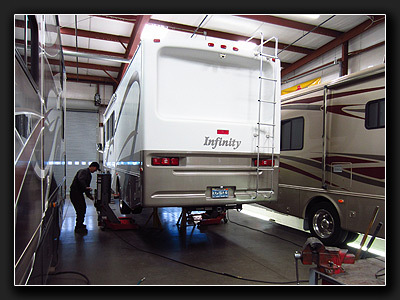 We sell, service and install Roadmaster, Super Steer, Davis Tru-Trac, Banks Power, BD Performance and other fine performance upgrades for your Motor Homes. 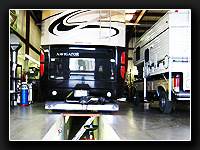 We have Air Filters and Intake Systems, Power Programmers, Exhaust Systems and Mufflers, Digital and Analog Gauges, Torque Converters, Exhaust Brakes and other products for Towing and Pleasure Driving, These products add significant Safety, Power, Fuel Economy and enjoyment to your Motor Home.